The Mustang Dream Giveaway is back! To celebrate 50 years of the iconic car-chase film, Bullitt, you can bring home the world’s finest 1968 Mustang Bullitt restomod and a brand-new 2019 Mustang Bullitt. Are you ready to unleash your inner Steve McQueen in these grand-prize Mustang Bullitts? 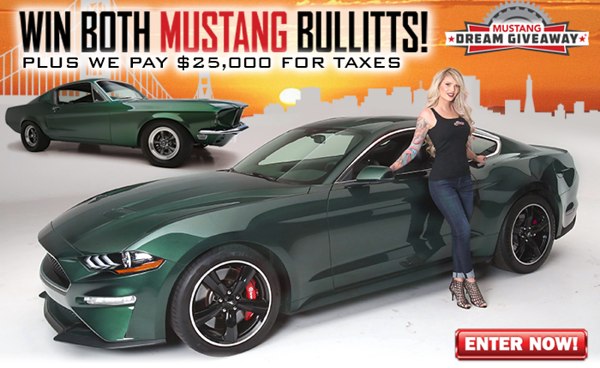 Enter now and you'll double your chances to win, compliments of Mustang Depot! SCORE THIS BRAND-NEW 2019 MUSTANG BULLITT - EQUIPPED WITH GENUINE FORD PERFORMANCE PARTS! This new limited-edition 2019 Mustang Bullitt is your all-access pass to fun, fun, fun. It features all the best performance, luxury and cool that Ford can engineer, like a 480hp fuel-injected V-8 engine, 6-speed manual transmission and every factory option Ford offers. To help take it to the next level, this muscle machine also has specially selected genuine Ford Performance parts, including a short-throw shifter, lowering springs and Bullitt-proof half shafts. Get ready to rule the road behind the wheel of this exclusive muscle machine! This 1968 Mustang Bullitt was meticulously restored with one goal in mind: perfection. You'll find the ultimate in performance and fun, thanks to the classic Ford 390 cubic-inch engine, five-speed manual transmission and restomod upgrades from bumper to bumper. When you want to show off, your new Mustang—already an Autorama Show alumnus— is ready for you to start bringing home trophy after trophy after trophy! This classic Pony is so spectacular that we even think Steve McQueen, if he were alive, would love to own it as his personal vehicle. ENTER TO WIN AND HELP CHILDREN IN NEED AND OUR VETERANS!